Going to art galleries and museums have changed nowadays. Back then, the museum experience people get are usually only from their school field trips or for an academic requirement. Today, people are deliberately flocking the places though they have an agenda aside from the exhibit. Though many people go to museums just to get an OOTD, Instagram, or Facebook shot due to the aesthetics of the environment, some still go for art appreciation and interpretation as their main purpose. Thankfully, Gateway Gallery wants to set the bar that will promote information, at the same time offering the visually aesthetic experience for the people. Gateway Gallery is currently featuring Sining Lakbay: Philippine History in Augmented Reality, the first Augmented Reality exhibit in the country! Showcasing the prowess of artists, curators, editors, filmmakers, historians, and technology experts, the gallery will take you back in time to the prehistoric Philippines up until our present era. The gallery segments our nation’s history into 30 life-size masterpieces, 10 of which features the groundbreaking “AR” or augmented reality technology. So how does this crafty feature work? It’s an easy feat! With the help of the stable WiFi connection provided by the gallery and your personal smartphone or any tablet devices, you just need to download the app “Layar – Augmented Reality”. This won’t take a while. If the app’s download is done, open it and allow it to scan the piece. Paintings with the AR feature are labeled so you won’t get confused! In a few seconds, the art will come alive through your smartphone as it plays a visually appealing short information video about the painting’s featured era. Information-wise, it contains accurate content that is objective from which anyone can easily pick-up insights from. The experience is definitely a must-try for all ages. It’s a quick refresher about our motherland’s colorful culture and its deep roots. The insights that you can pick-up from the exhibit will be a powerful tool for us Filipinos on how can we strive forward in reaching new heights as a nation. The gallery is timely and relevant as we know that, today, there are history revisionism attempts in our period. It is essential to stay objective by absorbing the facts rather than taking in the hearsay interpretations. Like the old saying goes, one who does not learn from the past are condemned to repeat it. Check the exhibit out at the 5th Floor of Gateway Tower in Araneta Center Cubao! Don’t you worry because this one is here to stay for a long time so gather around your friends and families for this one! 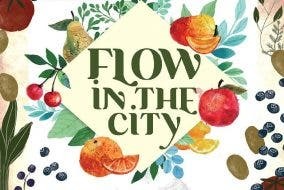 Follow the Flow to Flow In The City’s Fashion Food Wellness this March 24 to 26!